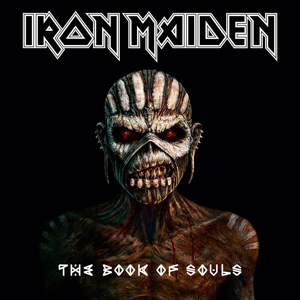 IRON MAIDEN’s eagerly awaited new studio album The Book Of Souls will be released globally on 4th September through Parlophone Records (Sanctuary Copyrights/BMG in the U.S.A.). It was recorded in Paris with their longstanding producer Kevin “Caveman” Shirley in late 2014, with the finishing touches added earlier this year. However, the band decided to delay its release so that vocalist Bruce Dickinson, who was recently given the all-clear from a tumour, would have time to recuperate sufficiently to join in the preparations for the album’s launch.<>P The stunning cover art was created by Mark Wilkinson, who has worked with the band previously, and because this 11-track album has a total running time of 92 minutes, it is IRON MAIDEN’s first ever double studio album. There’s a broader split on the songwriting compared to previous MAIDEN records, with bassist and founder member Steve Harris contributing to seven of the tracks; 6 of them with MAIDEN’s guitarists and one sole composition. This is also the first time since 1984’s Powerslave that an IRON MAIDEN studio album also features two tracks written solely by Bruce Dickinson, one of which is the longest song MAIDEN has ever recorded! And also two Dickinson/Smith collaborations. The Book Of Souls is the band’s 16th studio album since their eponymous debut in 1980 charted at #4 in the UK, in a career achieving sales of over 90 million albums worldwide. Their previous album, 2010’s The Final Frontier was MAIDEN’s most successful chart-wise to date, reaching Number One in 28 countries and was their highest chart debut in the U.S reaching #4 in the Billboard 200. Due to Bruce’s illness the band had to delay touring plans but promise to be out on the road again early next year, giving time for Bruce to make a full physical recovery to be ready for the rigors of MAIDEN live performances.